“Antibodies are highly specialized proteins of our immune system, made up by amino acids. A key determinant of the antibody characteristics is the antigen binding site, represented by “fingers” on the tip of the sketch. We selected a natural occurring antibody framework and introduced a novel binding loop that carries the amino acid sequence LYNNHERSHMAN. Using biotechnological processes, we have generated the Lynn Hershman antibody and analyzed its unique biophysical and functional properties. The Lynn Hershman antibody is shown as powder in a glass vial. 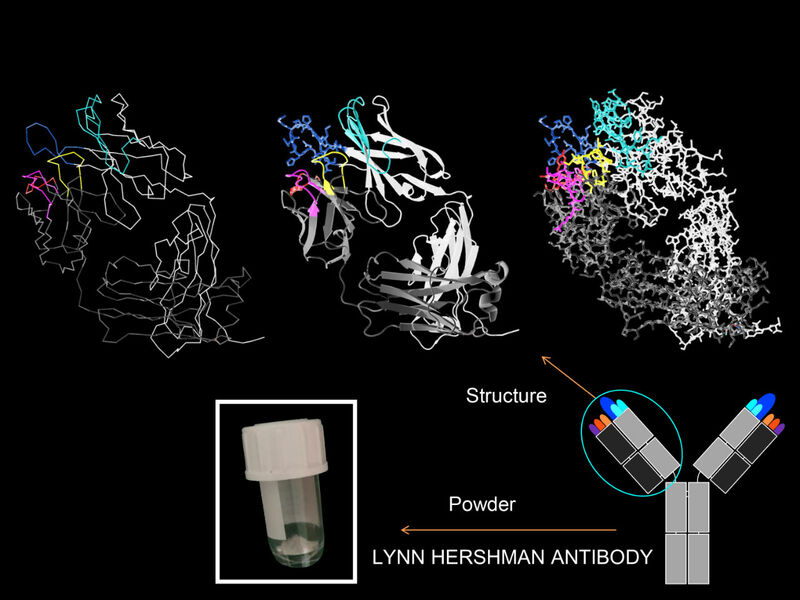 The structure of the Lynn Hershman antibody was visualized using PyMOL.” Courtesy of Novartis. HeK (House of Electronic Arts, Basel) has recently dedicated the solo show “Anti-Bodies” to Lynn Hershman Leeson (1941, Cleveland, Ohio), which focuses on her most recent studies into biological advancement, regenerative medicine, antibodies and genetic research. As a pioneer of media art, her practice has always investigated the subject as a field of self-construction and self-observation in panoptic society, from her early works such as Roberta Breitmore or The Electronic Diaries in the 70s and the 80s to her online persona DNA in the 90s. Therefore the construction of identity is at the heart of her research and it has been gradually shifted from video, performance and virtual reality to what she understands to be the newest challenge of our time: the developments in biotechnology and their impact on society. Indeed she states that the ultimate surveillance is DNA, which is in itself a form of encrypted archive . Not only can it be used as a storage medium for information, but it also implies ethical questions as in the age of synthetic biology the boundaries between natural and artificial life are increasingly dissolving. Indeed, as Peter Sloterdijk’s research points out, the farming of humanity is inevitable when cloning and eugenics are made more and more effortlessly possible. It also raises questions about the sustainability of these scientific methods and medical care, which could exacerbate the rich-poor divide in society. The exhibition consists of two main works: the video Strange Cultures (2007) and the eight room installation The Infinite Engine. The former, which features the participation of Tilda Swinton, is based on the case of Steve Kurtz, a member of the Critical Art Ensemble, an artist collective that deals with genetically modified food and wants to raise awareness of critical issues and lack of government regulation about the current practices in biotechnology. Kurtz’s wife died from from heart failure, and paramedics became suspicious as they found some scientific devices at his home (he was experimenting with bacteria); he was subsequently accused of bioterrorism. The second work is a complex multi-room installation staged as a scientific laboratory, which is the epistemological origin of modern life science and a place where knowledge is produced. As stated in the catalogue Civic Radar, the shift of location from a museum to a laboratory makes it necessary to become acquainted with new epistemologies and the logic of the techno-scientific regime. This regime governs experimental benchwork through protocols, techniques, methods, instruments, and equipment, as well as a complex set of human and non-human agents, for example, patents and the flow of global capital . The audience is invited to wear lab coats, which are hung at the entrance, in order see the exhibition from the perspective of a scientist. In fact the first room, a corridor with a mirror on one side and a video on the other, is shot in the medical school in Berkley and shows a researcher walking in the lab: it is anonymous, a typical non-place which is similar in every part of the world. The second room, with the photographic work Double Hands which refers to Michelangelo’s fresco about the creation of humanity, is about techniques of regenerative medicine and particularly about 3D bioprinting as shown in a video with Dr. Anthony Atala. An installation with folders that can be read by the public invites scientific research to be open and understandable, when the norm is for discoveries to be held back from people. Lynn Hershman reminds us that technology is never neutral, so everybody should have the instruments to understand it and decide how to use it. Another part of the show is dedicated to genetic engineering and the production of transgenic organisms, in this case represented by an aquarium full of live, glow-in-the-dark zebra fish. It gives also an insight about CRISPR (Clustered Regularly Interspaced Short Palindromic Repeats) technology, a simple yet powerful tool for editing genomes. It allows researchers easily to alter DNA sequences and modify gene function. Its many potential applications include correcting genetic defects, treating and preventing the spread of diseases and improving crops. As the title of the exhibition suggests, a huge space is dedicated to antibodies, which are proteins that play an essential role in the natural immune system and are developed in research settings for therapeutic purposes. One particular antibody is shown, named Lynn Hershman (as antibodies are proteins, they are made of amino acids, which are 20 and correspond to 20 letters of the alphabet), created by Novartis Pharma AG and proved to be extremely versatile. The rooms are also full of monitors and iPads that show interviews with scientists and researchers, such as Dr. Elizabeth H. Blackburn (Nobel Prize in Physiology or Medicine 2009). Visitors can also participate in a “capture room”, devised in collaboration with Mark Hellar, in which facial-recognition software captures images of visitors and reveals their DNA origins, as well as adding the information to an evolving composite archetype, particularly interesting as a development of her research about surveillance.